Color is a fairly basic test and used quite often when dealing with mineral oils. 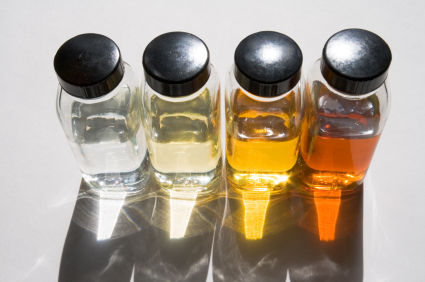 Pharmaceutical grade mineral oils are typically colorless and transparent. Determining the color of an oil can be done bye eye, but when dealing with mineral oils it is best to use proper instrumentation. Textile lubricants tend to be colorless to prevent staining, while pharmaceutical grade lubricants are colorless because they are primarily used as laxatives in the medicinal world. Pharmaceutical grade lubricants are also used in certain ointments. Furthermore, these white mineral oils are used for food processing equipment. These oils are used directly by humans and by equipment that produces food for humans. Therefor it is extremely important to meet certain specifications. Laxative oils should be colorless and odorless as well. This result is achieved by the removal of nitrogen, sulfur, and other reactive hydrocarbons. In most cases the color of a particular oil indicates it’s degree of refinement. However, this is not the case all of the time. A products quality shouldn’t be determined strictly by it’s color. The determination of color of mineral oil is mainly used for manufacturing quality control. Color is not a stability indicator. In fact, there is little or no technical significance based on an oils color.